Today, IBM released IBM Business Process Manager (BPM) 8.5, the latest in process management to optimize business processes and improve productivity. This has been a long expected release that Dave Hay talked about several weeks ago and was a big part of the IBM Impact conference a few weeks back as well. In this release, the IBM Connections integration has been taken to the next level to socialize business processes. The marriage of traditional business processes with social collaboration is something that I've been looking forward to for a long time. In fact, for a while there's been talk of moving from systems of record to systems of engagement. My take has always been that to foster adoption it's better to combine systems of records with systems of engagement. My colleague Rawn Shah wrote a great piece on this as the outcome of the Enterprise 2.0 conference shared here late last year. This is not the first time, however, that BPM has integrated with Connections. In IBM BPM 8.0, the IBM Connections business card could be surfaced within the BPM portal to raise awareness of experts within the system. 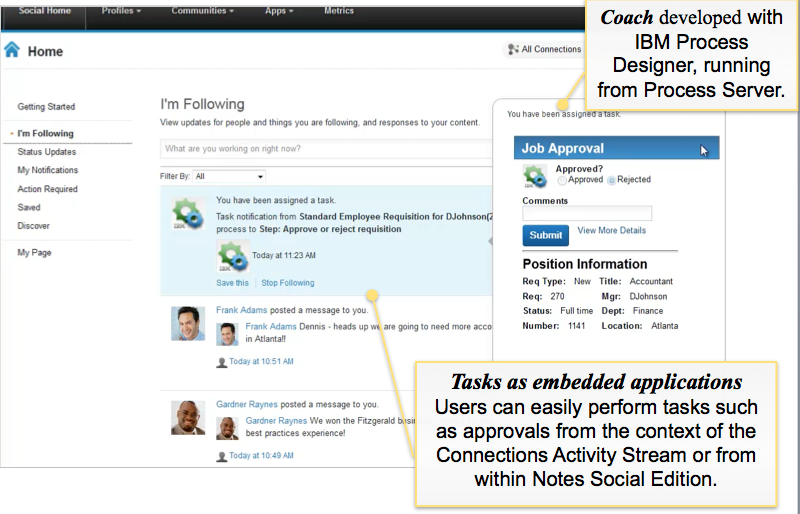 In today's release of IBM BPM 8.5, tasks and business processes, appear in the IBM Connections activity stream. Users can see that a new task or workflow has been assigned to them and take action directly within the stream. For example, if the task shouldn't be assigned to them they can re-assign it directly within Connections without having to switch context. If the task is for them, they can claim it and take action on it directly within Connections. "Debbie" uses BPM to submit a requisition getting help from a subject matter expert, "Frank"